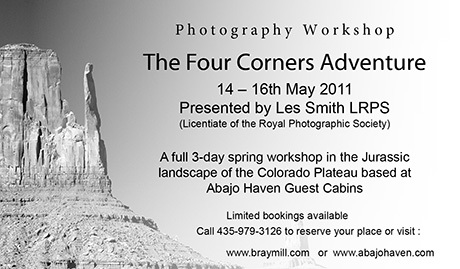 Zone-XI Photography places an advert in a newspaper in Grand Junction, Colorado to attract interest in the Spring Workshop “The Four Corners Adventure“. The article features a monochrome image of Left-Mitten in Monument Valley, one of the venues we’ll photograph on the Workshop. Please see our Workshop page for more information.